The Company entered advanced mechanised road construction in compliance with specifications set by the Ministry of Surface Transport in 1990. Since then, TCL has built roadways in iverse terrains – the hills of Mizoram, coastal areas of Kerala, plains of Punjab and the hard plateau of Karnataka – on schedule. 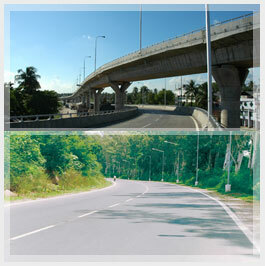 Tantia established its credentials in the field of construction, widening, conversion, maintenance, strengthening and beautification of roadways, road bridges, highways and lyovers. The Company's expertise in the maintenance of road infrastructure will translate into complete solutions for the benefit of the client, community and country. Extensive knowledge of the local terrain and culture, together with prior experience of undertaking projects on a pan-India basis, will result in nationwide road building opportunities. Internationally benchmarked quality and safety practices leading to quality consistency. The Company received the ISO 9001:2000 certification from DNV, the Netherlands, in 2001. Complete project cycle from concept to execution, leading to timely project delivery. The use of captively owned equipment (hot mix plants, sensor pavers, tandom rollers, soil compactors, stone crushers, tippers, loaders, excavators, motor-graders, concrete batching plants, transit mixers, concrete pumps, reversible drum mixers, dozers, cranes, weighbridges and a Company-owned diesel pump station) at project sites and a high mechanisation of project-related operations enabled accelerated project execution. A dedicated claims and contract management team to address project delays arising from delays in land acquisition and design bottlenecks. Effective working capital management, coupled with a provision of airlifted delivery for emergency purposes, ensure a steady supply of raw materials, equipment and spare parts across project duration and terrains. Execution of projects across terrain in Assam and Mizoram prone to heavy rain and landslides, enhancing remote accessibility. Tantia is the only Indian company to have fabricated a 100 metre span steel girder onsite, 4,000 metres above sea-level. Tantia enjoys a strong resource mobilization capability – equipment and individuals – in diverse terrains to deliver timely results. Tantia has invested substantially in the ownership of critical rail infrastructure equipment, leading to cost control and timely project completion. The division mainly recruits engineers with diploma and graduate degrees. The competence of its personnel has been a key growth driver for the division as it involves engineering skills that can be the differentiating factor to keep competitors at bay. In terms of project execution it plays a critical role by creating a brand for the company, built on engineering innovation. Catering to the needs of the wide clientele can be a challenge in itself. The need to understand specific client requirements in terms of quality and engineering specification have been managed professionally. All projects have been executed with a clear emphasis on customization to match specifications as provided by the client. © copyright 2008 - 2009. Tantia Constructions Ltd.